Elissa has loved performing since age 9, when she starred in a student-written play as a farmer who grows pickles. 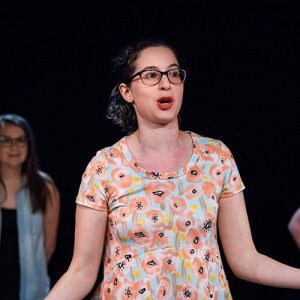 After spending years in withdrawal from college theater, Elissa signed up for an improv class at WIT in 2016 and became hooked on getting to perform in her own shoes. She completed WIT’s training program and has performed with indie team Swoonface. Offstage, she can be spotted forcing homemade cookies shaped like mittens or snails on everyone within her line of sight, drinking excessive amounts of cinnamon tea, or being told to stop talking so loudly.